"Punch drunk" redirects here. For other uses, see Punch drunk (disambiguation). Most documented cases have occurred in athletes involved in contact sports such as boxing, American football, wrestling, ice hockey, rugby and soccer. Other risk factors include being in the military, prior domestic violence, and repeated banging of the head. The exact amount of trauma required for the condition to occur is unknown. Definitive diagnosis can only occur at autopsy. Chronic traumatic encephalopathy is a form of tauopathy. There is no specific treatment. Rates of disease have been found to be about 30% among those with a history of multiple head injuries. Population rates, however, are unclear. Research in brain damage as a result of repeated head injuries began in the 1920s, at which time the condition was known as dementia pugilistica or "punch drunk syndrome". Changing the rules in some sports has been discussed as a means of prevention. Symptoms of CTE, which occur in four stages, generally appear eight to ten years after an athlete experiences repetitive mild traumatic brain injuries. First-stage symptoms include attention deficit hyperactivity disorder as well as confusion, disorientation, dizziness, and headaches. Second-stage symptoms include memory loss, social instability, impulsive behavior, and poor judgment. Third and fourth stages include progressive dementia, movement disorders, hypomimia, speech impediments, sensory processing disorder, tremors, vertigo, deafness, depression and suicidality. Additional symptoms include dysarthria, dysphagia, cognitive disorders such as amnesia, and ocular abnormalities, such as ptosis. The condition manifests as dementia, or declining mental ability, problems with memory, dizzy spells or lack of balance to the point of not being able to walk under one's own power for a short time and/or Parkinsonism, or tremors and lack of coordination. It can also cause speech problems and an unsteady gait. Patients with CTE may be prone to inappropriate or explosive behavior and may display pathological jealousy or paranoia. Most documented cases have occurred in athletes involved in contact sports such as boxing, American football, wrestling, ice hockey, rugby and soccer. Other risk factors include being in the military, prior domestic violence, and repeated banging of the head. The exact amount of trauma required for the condition to occur is unknown. 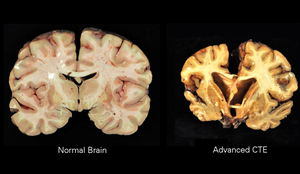 The neuropathological appearance of CTE is distinguished from other tauopathies, such as Alzheimer's disease. The four clinical stages of observable CTE disability have been correlated with tau pathology in brain tissue, ranging in severity from focal perivascular epicenters of neurofibrillary tangles in the frontal neocortex to severe tauopathy affecting widespread brain regions. On a microscopic scale, the pathology includes neuronal loss, tau deposition, TAR DNA-binding Protein 43 (TDP 43) deposition, white matter changes, and other abnormalities. The tau deposition occurs as dense neurofibrillary tangles (NFT), neurites, and glial tangles, which are made up of astrocytes and other glial cells Beta-amyloid deposition is a relatively uncommon feature of CTE. A small group of individuals with CTE have chronic traumatic encephalomyopathy (CTEM), which is characterized by symptoms of motor-neuron disease and which mimics amyotrophic lateral sclerosis (ALS). Progressive muscle weakness and balance and gait problems (problems with walking) seem to be early signs of CTEM. Exosome vesicles created by the brain are potential biomarkers of TBI, including CTE. A subtype of CTE is dementia pugilistica or boxer's dementia (from Latin pugilator - boxer) as it was initially found in those with a history of boxing, also called "punch-drunk syndrome". Loss of neurons, scarring of brain tissue, collection of proteinaceous, senile plaques, hydrocephalus, attenuation of the corpus callosum, diffuse axonal injury, neurofibrillary tangles, and damage to the cerebellum are implicated in the syndrome. The condition may be etiologically related to Alzheimer's disease. Neurofibrillary tangles have been found in the brains of dementia pugilistica patients, but not in the same distribution as is usually found in people with Alzheimer's. One group examined slices of brain from patients having had multiple mild traumatic brain injuries and found changes in the cells' cytoskeletons, which they suggested might be due to damage to cerebral blood vessels. Increased exposure to concussions and sub-concussive blows is regarded as the most important risk factor, which can depend on the total number of fights, number of knockout losses, the duration of career, fight frequency, age of retirement, and boxing style. Currently, CTE can only be definitively diagnosed by direct tissue examination after death, including full and immunohistochemical brain analyses. Abnormal p-tau accumulation in "neurons, astrocytes, and cell processes in an irregular pattern at the depths of the cortical sulci" is the most specific feature of CTE and required for pathological diagnosis. The lack of distinct biomarkers is the reason CTE cannot typically be diagnosed while a person is alive. Concussions are non-structural injuries and do not result in brain bleeding, which is why most concussions cannot be seen on routine neuroimaging tests such as CT or MRI. Acute concussion symptoms (those that occur shortly after an injury) should not be confused with CTE. Differentiating between prolonged post-concussion syndrome (PCS, where symptoms begin shortly after a concussion and last for weeks, months, and sometimes even years) and CTE symptoms can be difficult. Research studies are currently examining whether neuroimaging can detect subtle changes in axonal integrity and structural lesions that can occur in CTE. Recently, more progress in in-vivo diagnostic techniques for CTE has been made, using DTI, fMRI, MRI, and MRS imaging; however, more research needs to be done before any such techniques can be validated. PET tracers that bind specifically to tau protein are desired to aid diagnosis of CTE in living individuals. One candidate is the tracer [18F]FDDNP, which is retained in the brain in individuals with a number of dementing disorders such as Alzheimer's disease, Down syndrome, progressive supranuclear palsy, familial frontotemporal dementia, and Creutzfeldt–Jakob disease. In a small study of 5 retired NFL players with cognitive and mood symptoms, the PET scans revealed accumulation of the tracer in their brains. However, [18F]FDDNP binds to beta-amyloid and other proteins as well. Moreover, the sites in the brain where the tracer was retained were not consistent with the known neuropathology of CTE. A more promising candidate is the tracer [18F]-T807, which binds only to tau. It is being tested in several clinical trials. A putative biomarker for CTE is the presence in serum of autoantibodies against the brain. The autoantibodies were detected in football players who experienced a large number of head hits but no concussions, suggesting that even sub-concussive episodes may be damaging to the brain. The autoantibodies may enter the brain by means of a disrupted blood-brain barrier, and attack neuronal cells which are normally protected from an immune onslaught. Given the large numbers of neurons present in the brain (86 billion), and considering the poor penetration of antibodies across a normal blood-brain barrier, there is an extended period of time between the initial events (head hits) and the development of any signs or symptoms. Nevertheless, autoimmune changes in blood of players may consist the earliest measurable event predicting CTE. Robert A. Stern, one of the scientists at the Boston University CTE Center, said in 2015 that "he expected a test to be developed within a decade that will be able to diagnose C.T.E. in living people". Investigators have demonstrated that immobilizing the head during a blast exposure prevented the learning and memory deficits associated with CTE that occurred when the head was not immobilized. This research represents the first case series of postmortem brains from U.S. military personnel who were exposed to a blast and/or a concussive injury. Because of the concern that boxing may cause CTE, there is a movement among medical professionals to ban the sport. Medical professionals have called for such a ban since as early as the 1950s. There is currently no cure and it is not expected anytime soon. Treatment is supportive as with other forms of dementia. Rates of disease have been found to be about 30% among those with a history of multiple head injuries. Population rates, however, are unclear. Professional level athletes are the largest group with CTE, due to frequent concussions and sub-concussive impacts from play in contact sport. These contact-sports include American football, ice hockey, rugby, boxing, mixed martial arts, association football, and wrestling. In soccer, only prolific headers are known to have developed CTE. Other individuals that have been diagnosed with CTE were involved in military service, had a previous history of chronic seizures, victims of domestic abuse, and or were involved in activities resulting in repetitive head collisions. CTE was originally studied in boxers in the 1920s as dementia pugilistica. DP was first described in 1928 by a forensic pathologist, Dr. Harrison Stanford Martland, who was the chief medical examiner of Essex County in Newark, New Jersey in a Journal of the American Medical Association article, in which he noted the tremors, slowed movement, confusion, and speech problems typical of the condition. The seminal work on the disease came from British neurologist Macdonald Critchley, who in 1949 wrote a paper titled "Punch-drunk syndromes: the chronic traumatic encephalopathy of boxers." CTE was first recognized as affecting individuals who took considerable blows to the head, but was believed to be confined to boxers and not other athletes. As evidence pertaining to the clinical and neuropathological consequences of repeated mild head trauma grew, it became clear that this pattern of neurodegeneration was not restricted to boxers, and the term chronic traumatic encephalopathy became most widely used. In the early 2000s, Nigerian-American neuropathologist Bennet Omalu worked on the case of American football player Mike Webster, who died following unusual and unexplained behavior. In 2005 Omalu, along with colleagues in the Department of Pathology at the University of Pittsburgh, published his findings in the journal Neurosurgery in a paper which he titled "Chronic Traumatic Encephalopathy in a National Football League Player." This was followed by a paper on a second case in 2006 describing similar pathology. The word pugilistica is derived from the Latin word pugil ‘boxer’ (akin to pugnus ‘fist’, pugnāre ‘to fight’). It is also called chronic boxer's encephalopathy, traumatic boxer’s encephalopathy, boxer's dementia, pugilistic dementia, chronic traumatic brain injury associated with boxing (CTBI-B), and punch-drunk syndrome. DP has historically been considered equivalent to CTE. In 2005 forensic pathologist Bennet Omalu, along with colleagues in the Department of Pathology at the University of Pittsburgh, published a paper, "Chronic Traumatic Encephalopathy in a National Football League Player", in the journal Neurosurgery, based on analysis of the brain of deceased former NFL center Mike Webster. This was then followed by a paper on a second case in 2006 describing similar pathology, based on findings in the brain of former NFL player Terry Long. In 2008, the CSTE at Boston University at the BU School of Medicine started the CSTE brain bank at the Bedford VA Hospital to analyze the effects of CTE and other neurodegenerative diseases on the brain and spinal cord of athletes, military veterans, and civilians To date, the CSTE Brain Bank is the largest CTE tissue repository in the world. On December 21, 2009, the National Football League Players Association announced that it would collaborate with the CSTE at the Boston University School of Medicine to support the Center's study of repetitive brain trauma in athletes. Additionally, in 2010 the National Football League gave the CSTE a $1 million gift with no strings attached. In 2008, twelve living athletes (active and retired), including hockey players Pat LaFontaine and Noah Welch as well as former NFL star Ted Johnson, committed to donate their brains to CSTE after their deaths. In 2009, NFL Pro Bowlers Matt Birk, Lofa Tatupu, and Sean Morey pledged to donate their brains to the CSTE. In 2010, 20 more NFL players and former players pledged to join the CSTE Brain Donation Registry, including Chicago Bears linebacker Hunter Hillenmeyer, Hall of Famer Mike Haynes, Pro Bowlers Zach Thomas, Kyle Turley, and Conrad Dobler, Super Bowl Champion Don Hasselbeck and former pro players Lew Carpenter, and Todd Hendricks. In 2010, Professional Wrestlers Mick Foley, Booker T and Matt Morgan also agreed to donate their brains upon their deaths. Also in 2010, MLS player Taylor Twellman, who had to retire from the New England Revolution because of post-concussion symptoms, agreed to donate his brain upon his death. As of 2010, the CSTE Brain Donation Registry consists of over 250 current and former athletes. In 2011, former North Queensland Cowboys player Shaun Valentine became the first rugby player to agree to donate his brain upon his death, in response to recent concerns about the effects of concussions on Rugby League players, who do not use helmets. Also in 2011, boxer Micky Ward, whose career inspired the film The Fighter, agreed to donate his brain upon his death. In related research, the Center for the Study of Retired Athletes, which is part of the Department of Exercise and Sport Science at the University of North Carolina at Chapel Hill, is conducting research funded by National Football League Charities to "study former football players, a population with a high prevalence of exposure to prior Mild Traumatic Brain Injury (MTBI) and sub-concussive impacts, in order to investigate the association between increased football exposure and recurrent MTBI and neurodegenerative disorders such as cognitive impairment and Alzheimer's disease (AD)". In February 2011, Dave Duerson committed suicide, leaving text messages to loved ones asking that his brain be donated to research for CTE. The family got in touch with representatives of the Boston University center studying the condition, said Robert Stern, the co-director of the research group. Stern said Duerson's was the first time he was aware of that such a request had been left by a suicide potentially linked to CTE. Stern and his colleagues found high levels of the protein tau in Duerson's brain. These elevated levels, which were abnormally clumped and pooled along the brain sulci, are indicative of CTE. In 2013, President Barack Obama announced the creation of the Chronic Effects of Neurotrauma Consortium or CENC, a federally funded research project devised to address the long-term effects of mild traumatic brain injury in military service personnel (SM's) and Veterans. The CENC is a multi-center collaboration linking premiere basic science, translational, and clinical neuroscience researchers from the DoD, VA, academic universities, and private research institutes to effectively address the scientific, diagnostic, and therapeutic ramifications of mild TBI and its long-term effects. Nearly 20% of the more than 2.5 million U.S. Service Members (SMs) deployed since 2003 to Operation Enduring Freedom (OEF) and Operation Iraqi Freedom (OIF) have sustained at least one traumatic brain injury (TBI), predominantly mild TBI (mTBI), and almost 8% of all OEF/OIF Veterans demonstrate persistent post-TBI symptoms more than six months post-injury. Unlike those head injuries incurred in most sporting events, recent military head injuries are most often the result of blast wave exposure. After a competitive application process, a consortium led by Virginia Commonwealth University was awarded funding. The project principal investigator for the CENC is David Cifu, Chairman and Herman J. Flax professor of the Department of Physical Medicine and Rehabilitation (PM&R) at Virginia Commonwealth University (VCU) in Richmond, Virginia, with co-principal investigators Ramon Diaz-Arrastia, Professor of Neurology, Uniformed Services University of the Health Sciences, and Rick L. Williams, statistician at RTI International. ^ a b c d e f g h i j k l m n o p q r s t Asken, BM; Sullan, MJ; DeKosky, ST; Jaffee, MS; Bauer, RM (1 October 2017). "Research Gaps and Controversies in Chronic Traumatic Encephalopathy: A Review". JAMA Neurology. 74 (10): 1255–1262. doi:10.1001/jamaneurol.2017.2396. PMID 28975240. ^ a b c d e f g Stein, TD; Alvarez, VE; McKee, AC (2014). "Chronic traumatic encephalopathy: a spectrum of neuropathological changes following repetitive brain trauma in athletes and military personnel". Alzheimer's research & therapy. 6 (1): 4. doi:10.1186/alzrt234. PMC 3979082. PMID 24423082. ^ a b c d e f g h "Alzheimer's & Dementia". Alzheimer's Association. alz.org. Retrieved 21 September 2017. ^ a b Maroon, Joseph C; Winkelman, Robert; Bost, Jeffrey; Amos, Austin C; Mathyssek, Christina; Miele, Vincent (2015). "Chronic Traumatic Encephalopathy in Contact Sports: A Systematic Review of All Reported Pathological Cases". PLoS One. 10 (2): e0117338. doi:10.1371/journal.pone.0117338. PMC 4324991. PMID 25671598. ^ a b c McKee AC, Cantu RC, Nowinski CJ, Hedley-Whyte ET, Gavett BE, Budson AE, Santini VE, Lee HS, Kubilus CA, Stern RA (2009). "Chronic traumatic encephalopathy in athletes: progressive tauopathy after repetitive head injury". J Neuropathol Exp Neurol. 68 (7): 709–35. doi:10.1097/NEN.0b013e3181a9d503. PMC 2945234. PMID 19535999. ^ Corsellis; et al. (1973). "The Aftermath of Boxing". Psychological Medicine. 3 (3): 270–303. doi:10.1017/S0033291700049588. PMID 4729191. ^ a b Mendez MF (1995). "The neuropsychiatric aspects of boxing". International Journal of Psychiatry in Medicine. 25 (3): 249–262. doi:10.2190/CUMK-THT1-X98M-WB4C. PMID 8567192. ^ a b c d McKee AC, Stern RA, Nowinski CJ, Stein TD, Alvarez VE, Daneshvar DH, Lee HS, Wojtowicz SM, Hall G, Baugh CM, Riley DO, Kubilus CA, Cormier KA, Jacobs MA, Martin BR, Abraham CR, Ikezu T, Reichard RR, Wolozin BL, Budson AE, Goldstein LE, Kowall NW, Cantu RC (2013). "The spectrum of disease in chronic traumatic encephalopathy". Brain. 136 (Pt 1): 43–64. doi:10.1093/brain/aws307. PMC 3624697. PMID 23208308. ^ a b c d e Baugh CM, Stamm JM, Riley DO, Gavett BE, Shenton ME, Lin A, Nowinski CJ, Cantu RC, McKee AC, Stern RA (2012). "Chronic traumatic encephalopathy: neurodegeneration following repetitive concussive and subconcussive brain trauma". Brain Imaging Behavior. 6 (2): 244–54. doi:10.1007/s11682-012-9164-5. PMID 22552850. ^ Jancin, Bruce (1 June 2011). "Chronic traumatic encephalopathy test sought". Internal Medicine News. Retrieved 15 December 2013. ^ Taylor DD, Gercel-Taylor C (2014). "Exosome platform for diagnosis and monitoring of traumatic brain injury". Philosophical Transactions of the Royal Society of London. Series B, Biological Sciences. 369 (1652): 20130503. doi:10.1098/rstb.2013.0503. PMC 4142024. PMID 25135964. ^ Hof PR, Bouras C, Buée L, Delacourte A, Perl DP, Morrison JH (1992). "Differential Distribution of Neurofibrillary Tangles in the Cerebral Cortex of Dementia Pugilistica and Alzheimer's Disease Cases". Acta Neuropathologica. 85 (1): 23–30. doi:10.1007/BF00304630. PMID 1285493. ^ Geddes JF, Vowles GH, Nicoll JA, Révész T (1999). "Neuronal Cytoskeletal Changes are an Early Consequence of Repetitive Head Injury". Acta Neuropathologica. 98 (2): 171–178. doi:10.1007/s004010051066. PMID 10442557. ^ Jordan, B. D. (2009). Brain injury in boxing. Clinics in Sports Medicine, 28(4), 561–78, vi. ^ Omalu; et al. (2010). "Chronic traumatic encephalopathy, suicides and parasuicides in professional American athletes: the role of the forensic pathologist". Am J Forensic Med Pathol. 31 (2): 130–32. doi:10.1097/PAF.0b013e3181ca7f35. PMID 20032774. ^ "NIH Chronic Traumatic Encephalopathy Diagnosis Conference | National Institute of Neurological Disorders and Stroke". www.ninds.nih.gov. Retrieved 2019-01-29. ^ McKee, Ann C.; Cairns, Nigel J.; Dickson, Dennis W.; Folkerth, Rebecca D.; Dirk Keene, C.; Litvan, Irene; Perl, Daniel P.; Stein, Thor D.; Vonsattel, Jean-Paul (2016). "The first NINDS/NIBIB consensus meeting to define neuropathological criteria for the diagnosis of chronic traumatic encephalopathy". Acta Neuropathologica. 131 (1): 75–86. doi:10.1007/s00401-015-1515-z. ISSN 0001-6322. PMC 4698281. PMID 26667418. ^ Poirier MP (2003). "Concussions: Assessment, management, and recommendations for return to activity". Clinical Pediatric Emergency Medicine. 4 (3): 179–85. doi:10.1016/S1522-8401(03)00061-2. ^ Villemagne VL, Fodero-Tavoletti MT, Masters CL, Rowe CC (2015). "Tau imaging: early progress and future directions". The Lancet. Neurology. 14 (1): 114–24. doi:10.1016/S1474-4422(14)70252-2. PMID 25496902. ^ Small GW, Kepe V, Siddarth P, Ercoli LM, Merrill DA, Donoghue N, Bookheimer SY, Martinez J, Omalu B, Bailes J, Barrio JR (2013). "PET scanning of brain tau in retired national football league players: preliminary findings". Am J Geriatr Psychiatry. 21 (2): 138–44. CiteSeerX 10.1.1.372.2960. doi:10.1016/j.jagp.2012.11.019. PMID 23343487. ^ a b Montenigro PH, Corp DT, Stein TD, Cantu RC, Stern RA (2015). "Chronic traumatic encephalopathy: historical origins and current perspective". Annual Review of Clinical Psychology. 11: 309–30. doi:10.1146/annurev-clinpsy-032814-112814. PMID 25581233. ^ John Mangels, Cleveland Plain Dealer, 2013/03. ^ Marchi N, Bazarian JJ, Puvenna V, Janigro M, Ghosh C, Zhong J, Zhu T, Blackman E, Stewart D, Ellis J, Butler R, Janigro D (2013). "Consequences of repeated blood-brain barrier disruption in football players". PLoS ONE. 8 (3): e56805. doi:10.1371/journal.pone.0056805. PMC 3590196. PMID 23483891. ^ "Robert A. Stern, Ph.D." (bio), BU CTE Center. Retrieved 2015-08-11. ^ Nocera, Joe, "N.F.L. 's Bogus Settlement for Brain-Damaged Former Players" (op-ed column), New York Times, August 11, 2015. Retrieved 2015-08-11. ^ Goldstein LE, Fisher AM, Tagge CA, Zhang XL, Velisek L, Sullivan JA, Upreti C, Kracht JM, Ericsson M, Wojnarowicz MW, Goletiani CJ, Maglakelidze GM, Casey N, Moncaster JA, Minaeva O, Moir RD, Nowinski CJ, Stern RA, Cantù RC, Geiling J, Blusztajn JK, Wolozin BL, Ikezu T, Stein TD, Budson AE, Kowall NW, Chargin D, Sharon A, Saman S, Hall GF, Moss WC, Cleveland RO, Tanzi RE, Stanton PK, McKee AC (2012). "Chronic traumatic encephalopathy in blast-exposed military veterans and a blast neurotrauma mouse model". Sci Transl Med. 4 (134): 134ra60. doi:10.1126/scitranslmed.3003716. PMC 3739428. PMID 22593173. ^ Corsellis JA (1989). "Boxing and the Brain". BMJ. 298 (6666): 105–109. doi:10.1136/bmj.298.6666.105. PMC 1835400. PMID 2493277. ^ "Chronic Traumatic Encephalopathy - Diagnosis and Treatment". Mayo Clinic. Retrieved 27 February 2018. ^ "Treating CTE". NHS Choices. GOV.UK. Retrieved February 14, 2018. ^ Saulle M, Greenwald BD (2012). "Chronic traumatic encephalopathy: a review" (PDF). Rehabil Res Pract. 2012: 1–9. doi:10.1155/2012/816069. PMC 3337491. PMID 22567320. ^ a b Stone, Paul (March 18, 2014). "First Soccer and Rugby Players Diagnosed With CTE". Neurologic Rehabilitation Institute at Brookhaven Hospital. Retrieved March 21, 2016. ^ a b Ling, Helen; Morris, Huw R.; Neal, James W.; Lees, Andrew J.; Hardy, John; Holton, Janice L.; Revesz, Tamas; Williams, David D.R. (March 2017). "Mixed pathologies including chronic traumatic encephalopathy account for dementia in retired association football (soccer) players". Acta Neuropathologica. 133 (3): 337–352. doi:10.1007/s00401-017-1680-3. PMC 5325836. PMID 28205009. ^ Daneshvar DH, Nowinski CJ, McKee AC, Cantu RC (2011). "The epidemiology of sport-related concussion". Clin Sports Med. 30 (1): 1–17, vii. doi:10.1016/j.csm.2010.08.006. PMC 2987636. PMID 21074078. ^ Daneshvar DH, Riley DO, Nowinski CJ, McKee AC, Stern RA, Cantu RC (2011). "Long-term consequences: effects on normal development profile after concussion". Phys Med Rehabil Clin N Am. 22 (4): 683–700, ix. doi:10.1016/j.pmr.2011.08.009. PMC 3208826. PMID 22050943. ^ Martland HS (1928). "Punch Drunk". Journal of the American Medical Association. 91 (15): 1103–1107. doi:10.1001/jama.1928.02700150029009. ^ "'Concussion' Subject Bennet Omalu Exaggerated His Role, Researchers Say". CBS New York. December 17, 2015. ^ Martland H (1928). "Punch Drunk". The Journal of the American Medical Association. 91 (15): 1103–07. doi:10.1001/jama.1928.02700150029009. ^ a b "New pathology findings show significant brain degeneration in professional athletes with history of repetitive concussions", Center for the Study of Traumatic Encephalopathy, September 25, 2008. ^ "Seau family revisiting brain decision". ESPN. May 6, 2012. Archived from the original on May 6, 2012. ^ "Our Team". Brain Injury Research Institute. Archived from the original on 2011-06-07. ^ Pugilism (origin), retrieved on 2013-2-2. ^ NCERx. 2005. Brain Trauma, Subdural Hematoma and Dementia Pugilistica. About-dementia.com. Retrieved on 2007-12-19. ^ Staff. "NFL Players Association to Support Brain Trauma Research at Boston University", Center for the Study of Traumatic Encephalopathy press release dated December 21, 2009. Accessed August 17, 2010. ^ Support and Funding Archived July 15, 2010, at the Wayback Machine, Center for the Study of Traumatic Encephalopathy. Accessed August 17, 2010. ^ Schwarz, Alan. "N.F.L. Donates $1 Million for Brain Studies", The New York Times, April 20, 2010. Accessed August 17, 2010. ^ "Welch to donate brain for concussion study". Edmonton Journal. Archived from the original on 2010-10-06. Retrieved 2008-12-18. ^ Staff. "Three active NFL Pro Bowl players to donate brains to research", Center for the Study of Traumatic Encephalopathy press release dated September 14, 2009. Accessed August 17, 2010. ^ Staff. "20 more NFL stars to donate brains to research", Center for the Study of Traumatic Encephalopathy press release dated February 1, 2010. Accessed August 17, 2010. ^ "A Study on the Association Between Football Exposure and Dementia in Retired Football Players". UNC College of Arts and Sciences. ^ Smith, Michael David, "Boston researchers request Junior Seau's brain". NBC Sports Pro Football Talk, May 3, 2012. Retrieved 2012-05-03. ^ Kusinski, Peggy (2011-02-19). "Dave Duerson Committed Suicide: Medical Examiner". NBC Chicago. Retrieved 2011-02-20. ^ Schwarz, Alan (February 20, 2011). "Before Suicide, Duerson Asked for Brain Study". The New York Times. ^ Schwarz, Alan (March 2, 2011). "Hockey Brawler Paid Price, With Brain Trauma". The New York Times. Retrieved March 14, 2011. ^ "Researchers Discover Brain Trauma in Sports May Cause a New Disease That Mimics ALS", BUSM press release, August 17th, 2010 3:41 pm. Retrieved 2011-09-11. ^ Jordan, Bryant (August 12, 2013). "Obama Introduces New PTSD and Education Programs". military.com. Retrieved 2 May 2014. ^ "Obama administration to research TBI, PTSD in new efforts Read more: Chronic Effects of Neurotrauma Consortium". fiercegovernment.com. Archived from the original on 2 May 2014. Retrieved 2 May 2014. ^ "DoD, VA Establish Two Multi-Institutional Consortia to Research PTSD and TBI". va.gov. Retrieved 2 May 2014. ^ a b "Fact Sheet: Largest federal grant in VCU's history". spectrum.vcu.edu. Retrieved 2 May 2014. ^ a b "VCU to lead major study of concussions". grpva.com. Archived from the original on 3 May 2014. Retrieved 2 May 2014. ^ a b c "DOD partners to combat brain injury". army.mil. Retrieved 2 May 2014. ^ Warden D. Military TBI during the Iraq and Afghanistan wars. J Head Trauma Rehabil. 2006; 21 (5): 398–402. ^ "DoD Worldwide Numbers for TBI". dvbic.dcoe.mil. Retrieved 4 Feb 2013. ^ Scholten JD, Sayer NA, Vanderploeg RD, Bidelspach DE, Cifu DX (2012). "Analysis of US Veterans Health Administration comprehensive evaluations for traumatic brain injury in Operation Enduring Freedom and Operation Iraqi Freedom Veterans". Brain Inj. 26 (10): 1177–1184. doi:10.3109/02699052.2012.661914. PMID 22646489. ^ Taylor BC, Hagel EM, Carlson KF, Cifu DX, Cutting A, Bidelspach DE, Sayer NA (2012). "Prevalence and costs of co-occurring traumatic brain injury with and without psychiatric disturbance and pain among Afghanistan and Iraq War Veteran V.A. users". Med Care. 50 (4): 342–346. doi:10.1097/MLR.0b013e318245a558. PMID 22228249. ^ "Fact Sheet: The Obama Administration's Work to Honor Our Military Families and Veterans". whitehouse.gov. Retrieved 2 May 2014. ^ "Fact Sheet: VCU will lead $62 million study of traumatic brain injuries in military personnel". news.vcu.edu. Retrieved 2 May 2014. ^ About Us Archived December 22, 2015, at the Wayback Machine, Department of Physical Medicine and Rehabilitation, Virginia Commonwealth University. Retrieved 2015-12-21. ^ McCrory P, Meeuwisse WH, Kutcher JS, Jordan BD, Gardner A (2013). "What is the evidence for chronic concussion-related changes in retired athletes: behavioral, pathological and clinical outcomes?". Br J Sports Med. 47 (5): 327–330. doi:10.1136/bjsports-2013-092248. PMID 23479493.